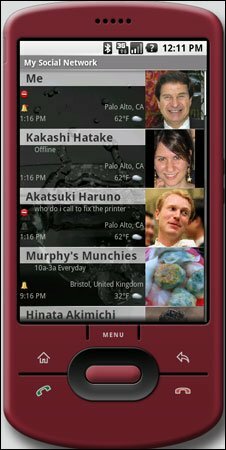 An intelligent, mobile-phone-based social network is being tested by researchers at Hewlett Packard. Friendlee analyses calls and messages to build up a picture of a person's closest correspondents. Regular contacts are displayed more prominently so that users do not have to wade through a phonebook to find them. The system also analyses which firms a person uses to generate recommendations to other people in their network. "It builds a network of people that you communicate with," explained Bernardo Huberman, director of the social computing lab at the firm's Palo Alto research centre. "If you stop communicating with those people or you begin to communicate [with them] less they keep dropping down to the bottom of your list." The application is currently undergoing laboratory testing before it is shown off at the Mobile HCI conference in Bonn, Germany, in September. It has been developed, in part, as a response to research done by HP into how people use social networks. Last year, for example, Professor Huberman's group analysed the relationships on Twitter. "We were able to tease out information from the service," explained Professor Huberman. It concluded that many relationships on Twitter were "meaningless from an interaction point of view." "A link between any two people does not necessarily imply an interaction between them," the team wrote. Instead, most people using the service tend to interact with very few people, even though they may follow many. Studies of Facebook and YouTube show a similar pattern, he said. "Social networks that truly matter - those ones where you are actually communicated in a human sense - happen to be much smaller than the circle of followers," said Professor Huberman. Friendlee has been created to address this issue. It constructs what the researchers call an "intimate social network". "The idea of a social network that deals with reciprocity - I call you, you call me, we interact and so on - is much more meaningful than a listing like your whole Rolodex of everyone you've ever met," explained Professor Huberman. The application constructs the list by analysing the user's call and messaging history to identify the people they are closest to. "By using phone conversations as an indicator of close social interaction, Friendlee trims the user's large casual social network into a core intimate one," the researchers wrote in the paper to be presented in Bonn. The system also contains functions similar to services such as Google Latitude and BrightKite that allow a user to share their whereabouts with friends. However, Friendlee will also share other "situational data", such as local time and weather, as well as allowing people to browse the friend lists of close connections. Another function trawls phone records to draw up a list of preferred businesses, which can also be shared with friends. "Close friends and colleagues remain among our most influential sources of practical advice and recommendations about services, such as health insurance and restaurants, as well as about people, in both social and professional," the researchers write. Users will be able to control which of their friends has access to different information. The applications currently runs on both Windows Mobile and Google Android handsets. A prototype for Blackberry users was also been shown off at the Wireless Enterprise Symposium in May. "We can make it run on anything," said Professor Huberman. The application will be shown off at the Mobile HCI conference in Bonn, Germany between 15-18 September. It has been developed by Professor Huberman along with Anupriya Ankolekar and Gabor Szabo.